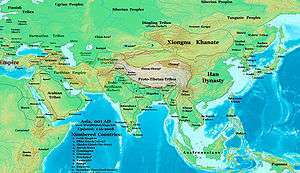 The Xiongnu (Old Chinese: /qʰoŋ.nˤa/, Wade–Giles: Hsiung-nu), were a confederation of nomadic peoples who, according to ancient Chinese sources, inhabited the eastern Asian Steppe from the 3rd century BC to the late 1st century AD. Chinese sources report that Modu Chanyu, the supreme leader after 209 BC, founded the Xiongnu Empire. Attempts to identify the Xiongnu with later groups of the western Eurasian Steppe remain controversial. Scythians and Sarmatians were concurrently to the west. The identity of the ethnic core of Xiongnu has been a subject of varied hypotheses, because only a few words, mainly titles and personal names, were preserved in the Chinese sources. The name Xiongnu may be cognate with that of the Huns and/or the Huna, although this is disputed. Other linguistic links – all of them also controversial – proposed by scholars include Iranian, Mongolic, Turkic, Uralic Yeniseian, Tocharian, or multi-ethnic. An early reference to the Xiongnu was by Sima Qian who wrote about the Xiongnu in the Records of the Grand Historian (c. 100 BCE), drawing a distinct line between the settled Huaxia people (Chinese) to the pastoral nomads (Xiongnu), characterizing it as two polar groups in the sense of a civilization versus an uncivilized society: the Hua–Yi distinction. Sources from the pre-Han eras often classified the Xiongnu as the Hu (胡) people, even though this was more a blanket term for nomadic people in general; it only became an ethnonym for the Xiongnu during the Han. Qin's campaign against the Xiongnu expanded the Qin dynasty's territory at the expense of the Xiongnu. In 215 BCE, Qin Shi Huang sent General Meng Tian to conquer the Xiongnu and drive them from the Ordos Loop, which he did later that year. After the catastrophic defeat at the hands of General Meng Tian, the Xiongnu leader Touman was forced to flee far into the Mongolian Plateau. 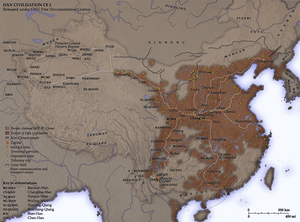 The Qin empire became a threat to the Xiongnu, which ultimately led to the reorganization of the many tribes into a confederacy. 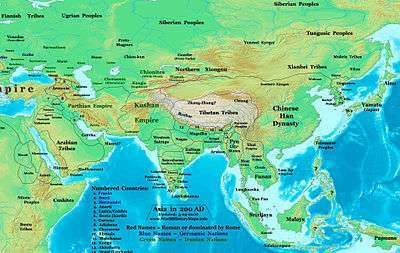 Asia in 200 BCE, showing the early Xiongnu state and its neighbors. Under Modu's leadership, the Xiongnu threatened the Han Dynasty, almost causing Emperor Gaozu, the first Han emperor, to lose his throne in 200 BCE. By the time of Modu's death in 174 BCE, the Xiongnu had driven the Yuezhi from the Hexi Corridor, killing the Yuezhi king in the process and asserting their presence in the Western Regions. In the winter of 200 BCE, following a siege of Taiyuan, Emperor Gaozu of Han personally led a military campaign against Modun. At the Battle of Baideng, he was ambushed reputedly by 300,000 elite Xiongnu cavalry. The emperor was cut off from supplies and reinforcements for seven days, only narrowly escaping capture. While the Xiongnu benefited handsomely, from the Chinese perspective marriage treaties were costly, humiliating, and ineffective. Laoshang showed that he did not take the peace treaty seriously. On one occasion his scouts penetrated to a point near Chang'an. In 166 BCE he personally led 140,000 cavalry to invade Anding, reaching as far as the imperial retreat at Yong. In 158 BCE, his successor sent 30,000 cavalry to attack Shangdang and another 30,000 to Yunzhong. When the Eastern Jin dynasty ended the XianbeiNorthern Wei received the Han Chinese Jin prince Sima Chuzhi 司馬楚之 as a refugee. A Northern Wei Xianbei Princess married Sima Chuzhi, giving birth to Sima Jinlong 司馬金龍. Northern Liang Xiongnu King Juqu Mujian's daughter married Sima Jinlong. Ban Chao, Protector General (都護; Duhu) of the Han dynasty, embarked with an army of 70,000 men in a campaign against the Xiongnu insurgents who were harassing the trade route we now know as the Silk Road. His successful military campaign saw the subjugation of one Xiongnu tribe after another. Ban Chao also sent an envoy named Gan Ying to Daqin (Rome). Ban Chao was created the Marquess of Dingyuan (定遠侯, i.e., "the Marquess who stabilized faraway places") for his services to the Han Empire and returned to the capital Luoyang at the age of 70 years and died there in the year 102. Following his death, the power of the Xiongnu in the Western Regions increased again, and the emperors of subsequent dynasties were never again able to reach so far to the west. The Xiongnu's new power was met with a policy of appeasement by Emperor Guangwu. At the height of his power, Huduershi even compared himself to his illustrious ancestor, Modu. Due to growing regionalism among the Xiongnu, however, Huduershi was never able to establish unquestioned authority. When he designated his son as heir apparent (in contravention of the principle of fraternal succession established by Huhanye), Bi, the Rizhu king of the right, refused to attend the annual meeting at the chanyu's court. As the eldest son of the preceding chanyu, Bi (Pi) had a legitimate claim to the succession. In A.D. 48, two years after Huduershi's son Punu ascended the throne, eight Xiongnu tribes in Bi's powerbase in the south, with a military force totalling 40,000 to 50,000 men, acclaimed Bi as their own chanyu. 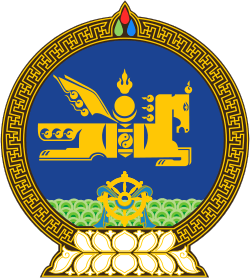 Throughout the Eastern Han period, these two groups were called the kingdom of southern Xiongnu (confederates in Inner Mongolia) and the kingdom of northern Xiongnu (the ancient Hunnic kingdom of the Orkhon in Outer Mongolia), respectively. In A.D. 49, Tsi Yung, allied with the Wuhuan and Xianbei, attacked the northern kingdom. Hard pressed by the northern Xiongnu and plagued by natural calamities, Bi brought the southern Xiongnu into tributary relations with Han China in 50. The tributary system was considerably tightened to keep the southern Xiongnu under Han supervision. The chanyu was ordered to establish his court in the Meiji district of Xihe commandery. The southern Xiongnu were resettled in eight frontier commanderies. At the same time, large numbers of Chinese were forced to migrate to these commanderies, where mixed settlements began to appear. The northern Xiongnu were dispersed by the Xianbei in 85 and again in 89 by the Chinese during the Battle of Ikh Bayan, in which the last Northern Chanyu was defeated and fled over to the north west with his subjects. Economically, the southern Xiongnu relied almost totally on Han assistance. Tensions were evident between the settled Chinese and practitioners of the nomadic way of life. Thus, in 94, Anguo Chanyu joined forces with newly subjugated Xiongnu from the north and started a large scale rebellion against the Han. Towards the end of the Eastern Han, the southern Xiongnu were drawn into the rebellions then plaguing the Han court. In 188, the chanyu was murdered by some of his own subjects for agreeing to send troops to help the Han suppress a rebellion in Hebei – many of the Xiongnu feared that it would set a precedent for unending military service to the Han court. The murdered chanyu's son Yufuluo, entitled Chizhisizhu (持至尸逐侯), succeeded him, but was then overthrown by the same rebellious faction in 189. He travelled to Luoyang (the Han capital) to seek aid from the Han court, but at this time the Han court was in disorder from the clash between Grand General He Jin and the eunuchs, and the intervention of the warlord Dong Zhuo. The chanyu had no choice but to settle down with his followers in Pingyang, a city in Shanxi. In 195, he died and was succeeded by his brother Hucuquan. In 216, the warlord-statesman Cao Cao detained Hucuquan in the city of Ye, and divided his followers in Shanxi into five divisions: left, right, south, north, and centre. This was aimed at preventing the exiled Xiongnu in Shanxi from engaging in rebellion, and also allowed Cao Cao to use the Xiongnu as auxiliaries in his cavalry. Eventually, the Xiongnu aristocracy in Shanxi changed their surname from Luanti to Liu for prestige reasons, claiming that they were related to the Han imperial clan through the old intermarriage policy. After Hucuquan, in A.D. 215-216, the southern Xiongnu were partitioned into five local tribes. Each local chief was under the "surveillance of a chinese resident", while the shanyu was in "semicaptivity at the imperial court." Huchuquan Chanyu assumed the patronymic Liu, reflecting his imperial ancestry. In 304, Liu Yuan became Chanyu of the Five Hordes. In 308, declared himself emperor and founded the Han Zhao Dynasty. In 311, his son and successor Liu Cong captured Luoyang, and with it the Emperor Huai of Jin China. In 316, the Emperor Min of Jin China was captured in Chang'an. Both emperors were humiliated as cupbearers in Linfen before being executed in 313 and 318. North China came under Xiongnu rule while the remnants of the Jin dynasty survived in the south at Jiankang. In 318, after suppressing a coup by a powerful minister in the Xiongnu-Han court (in which the Xiongnu-Han emperor and a large proportion of the aristocracy were massacred), the Xiongnu prince Liu Yao moved the Xiongnu-Han capital from Pingyang to Chang'an and renamed the dynasty as Zhao (Liu Yuan had declared the empire's name Han to create a linkage with Han Dynasty—to which he claimed he was a descendant, through a princess, but Liu Yao felt that it was time to end the linkage with Han and explicitly restore the linkage to the great Xiongnu chanyu Maodun, and therefore decided to change the name of the state. However, this was not a break from Liu Yuan, as he continued to honor Liu Yuan and Liu Cong posthumously.) (it is hence known to historians collectively as Han Zhao). The ruined city was discovered in 1996 and the State Council designated it as a cultural relic under top state protection. The repair of the Yong'an Platform, where Helian Bobo, emperor of the Da Xia regime, reviewed parading troops, has been finished and restoration on the 31-meter-tall turret will begin soon. There are hopes that Tongwancheng may achieve UNESCO World Heritage status. The sound of the first Chinese character (匈) has been reconstructed as /qʰoŋ/ in Old Chinese. The Chinese name for the Xiongnu was a pejorative term in itself, as the characters have the meaning of "fierce slave". The Chinese characters are pronounced as Xiōngnú [ɕi̯ʊ́ŋnǔ] in modern Mandarin Chinese. 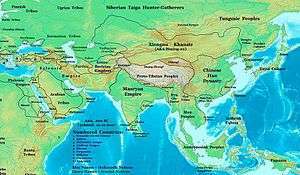 Chinese sources link the Tiele people and Ashina to the Xiongnu, not all Turkic peoples. According to the Book of Zhou and the History of the Northern Dynasties, the Ashina clan was a component of the Xiongnu confederation, but this connection is disputed, and according to the Book of Sui and the Tongdian, they were "mixed nomads" (雜胡 / 杂胡, Pinyin: zá hú, Wade–Giles: tsa hu) from Pingliang. The Ashina and Tiele may have been separate ethnic groups who mixed with the Xiongnu. Indeed, Chinese sources link many nomadic peoples (hu; see Wu Hu) on their northern borders to the Xiongnu, just as Greco-Roman historiographers called Avars and Huns "Scythians". The Greek cognate of Tourkia (Greek: Τουρκία) was used by the Byzantine emperor and scholar Constantine VII Porphyrogenitus in his book De Administrando Imperio, though in his use, "Turks" always referred to Magyars. Such archaizing was a common literary topos, and implied similar geographic origins and nomadic lifestyle but not direct filiation. Some Uyghurs claimed descent from the Xiongnu (according to Chinese history Weishu, the founder of the Uyghur Khaganate was descended from a Xiongnu ruler), but many contemporary scholars do not consider the modern Uyghurs to be of direct linear descent from the old Uyghur Khaganate because modern Uyghur language and Old Uyghur languages are different. Rather, they consider them to be descendants of a number of people, one of them the ancient Uyghurs. Bronze plaque of a man of the Ordos Plateau, long held by the Xiongnu. 3-1st century BCE. British Museum. Otto J. Maenchen-Helfen notes that the statuette displays clear Europoid features. A study based on mitochondrial DNA analysis of human remains interred in the Eg River valley of Mongolia concluded that the Turkic peoples originated from the same area and therefore are possibly related. A majority (89%) of the Xiongnu mtDNA sequences can be classified as belonging to Asian haplogroups, and nearly 11% belong to European haplogroups. This finding indicates that contact between European and Asian populations preceded the start of Xiongnu culture, and confirms results reported for two samples from an early 3rd century BC Scytho-Siberian population (Clisson et al. 2002). Another study from 2004 screened ancient samples from the Egyin Gol necropolis for the Y-DNA haplogroup N-Tat. The Egyin Gol necropolis, located in northern Mongolia, is ~2300 years old and belongs to the Xiongnu culture. This Tat-polymorphism is a biallelic marker – that defines the N1c (N3-Tat) Y-DNA haplogroup – what has so far been observed only in populations from Asia and northern Europe. It reaches its highest frequency in Yakuts and northern Uralic peoples, with significant parts also in Buryats and northeastern Siberian populations. Opinions differ about whether the geographic origin of the T-C mutation lies in Asia or northern Eurasia. Zerjal et al. 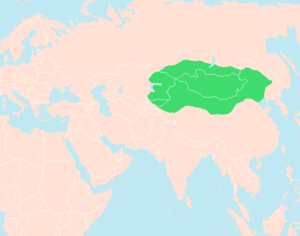 suggested that this mutation first arose in the populations of Central Asia; they proposed Mongolia as a candidate location for the origin of the T-C polymorphism. In contrast, for Lahermo et al. the wide distribution of the mutation in north Eurasian populations suggests that it arose in northern Eurasia. According to them, the estimated time of the C mutation is ~2400–4440 years ago. (According to some more recent researches of the Y-DNA Hg N the presence of N1c and N1b in modern Siberian and other Eurasian populations is considered to reflect an ancient substratum, probably speaking Uralic languages.) Concerning the Xiongnu people, two of them from the oldest section harboured the mutation, confirming that the Tat polymorphism already existed in Mongolia 2300 years ago. The next archaeogenetical occurrence of this N-Tat ancient DNA was found in Hungary among the so-called Homeconqueror Hungarians. Also three Yakuts' aDNA from the 15th century, and of two from the late 18th century were this haplogroup. Additionally two mtDNA sequence matches revealed in this work suggest that the Xiongnu tribe under study may have been composed of some of the ancestors of the present-day Yakut population. Another study of 2006, using genetic and archeological data from a Siberian grave of Pokrovsk recently discovered near the Lena River and dated from 2,400 to 2,200 years B.P., as well as modern Buryats, Khanty, Mansi, Evenk, and Yakuts, provided evidence for the existence of early contact between autochthonous hunters of the Siberian taiga and nomadic horse breeders from the Altai-Baikal area (Mongolia and Buryatia). The similarity of the mitochondrial haplotype of the Pokrovsk subject with a woman of the Eg River necropolis of the second or third century ( mtDNA D haplogroup) shows that this contact would have occurred by the end of the Xiongnu period, and possibly prior to the 3rd century BC. This contact could have been through either the expansion of the Xiongnu and other steppe peoples westwards to new areas of Siberia, or northwards along riverways. The Yenisei River in particular contributed to extensive east-west gene flow. The combined evidence demonstrates the close relationship between the Xiongnu and the Siberian populations. Another 2006 study observed genetic similarity among Mongolian samples from different periods and geographic areas including 2,300-year-old Xiongnu population of the Egyin Gol Valley. This results supports the hypothesis that the succession over time of different Turkic and Mongolian tribes in the current territory of Mongolia resulted in cultural rather than genetic changes. Furthermore, it appears that the Yakuts probably did not find their origin among the Xiongnu tribes as previously hypothesised. A research study of 2006 focused on Y-DNAs of the Egyin Gol site, and besides the confirmation of the above-mentioned two N3-Tats, it also identified a Q-M242 haplogroup from the middle period and a C-M130 haplogroup from the later (2nd century AD). The Q-M242 is one of the haplogroups of the indigenous peoples of the Americas (though this is not this subclade), and minor across Eurasia. Only two groups in the Old World are high majority Q-M242 groups. These are the Selkups (however, only one study was made) and the Ket people. They live in western and middle Siberia, together with the Khanty people. The Kets originally lived in southern Siberia. According to Uralistic literature the swift migration and disjunction of the Samoyedic peoples might be connected to a heavy warring in the region, probably due to the dissolution of the Xiongnu Empire in the period of the Battle of the Altai Mountains. The mutation defining haplogroup C-M130, is restrained in North and East Asia and in America (Bergen et al. 1998. 1999.) (Lell et al. 2002.). The highest frequencies of Haplogroup C3 are found among the populations of Mongolia and the Russian Far East, where it is generally the modal haplogroup. Haplogroup C3 is the only variety of Haplogroup C-M130 to be found among Native Americans, among whom it reaches its highest frequency in Na-Dené populations. A research project of 2007 (Yi Chuan, 2007) was aimed at the genetic affinities between Tuoba Xianbei and Xiongnu populations. Some mtDNA sequences from Tuoba Xianbei remains in Dong Han period were analyzed. Comparing with the published data of Xiongnu, the results indicated that the Tuoba Xianbei presented some close affinities to the Xiongnu, which implied that there was a gene flow between Tuoba Xianbei and Xiongnu during the two southward migrations. A recent examination in a Xiongnu elite cemetery in Duurlig Nars revealed a Western Eurasian male with maternal U2e1 and paternal R1a1 haplogroups and two other DNAs: a female with mtDNA haplogroup D4 and a male with Y-haplogroup C3 and mtDNA haplogroup D4. A study of 2010  analysed six human remains of a nomadic group, excavated from Pengyang County. From the mtDNA, six haplotypes were identified as three haplogroups: C, D4 and M10. The analyses revealed that these individuals were closely associated with the ancient Xiongnu and modern northern Asians. The analysis of Y chromosomes from four male samples that were typed as haplogroup Q-M242(all Q1a1-M120) indicated that these people had originated in Siberia. Over the past decade, Chinese archaeologists have published several reviews regarding the results of excavations in Xinjiang. They imply the Xiongnu's supreme ruling class. Particularly interesting are in the cemetery Heigouliang, Xinjiang (Black Gouliang cemetery, also known as the summer palace of Xiongnu king), east of Barkol basin, near the city of Hami. By typing results of DNA samples during the excavation of one of the tombs it was determined that of the 12 men there were: Q1a*(xQ-M120, xQ-M25, xQ-M3) - 6, Q1b (M378) - 4 (two separate tombs), Q*(xQ1a, xQ1b)-2 (unable to determine subclade). All Y-haplogroup Q1b-M378 represent hosts of the tombs, while half of Y-DNA Q1a* represents hosts and half sacrificial victims. They date from the time of early (Western) Han (2nd-1st Century BC). In another study, 3 in this place were identified as Q-M3. Summarizing the data from available evidences, it is concluded that the tombs belongs to the representatives of the Xiongnu/Hunnu nobility/conquerors. The Stele of Munmu Wang that Munmu was of the ethnic Xiongnu race. ↑ The Huns, Hyun Jin Kim, pg. 7. Quote: "There was doubtlessly also a large population of Turkic and Iranian language speakers among the Xiongnu." ↑ Nomadism in Iran: From Antiquity to the Modern Era, Daniel T. Potts, pg. 124. Quote: "For the possibility that the Xiongnu were Iranian speakers, see H. W. bailey, “Iranian in Hiung-nu,” in Monumentum Georg Morgenstierne, Acta Iranica 21 (Leiden: E. J. brill, 1981), 1:22–26." 1 2 Yü, Ying-shih (1986). "Han Foreign Relations". The Cambridge History of China, Volume 1: The Ch'in and Han Empires, 221 B.C. - A.D. 220. Cambridge: Cambridge University Press. p. 384. ISBN 0-521-24327-0. 1 2 3 Barfield, Thomas J. (1981). "The Hsiung-nu imperial confederacy: Organization and foreign policy". The Journal of Asian Studies. 41 (1): 48. JSTOR 2055601. ↑ Ancient Hun Capital Bids for World Cultural Site, China . ↑ Keyser-Tracqui, C (2004). "Does the Tat polymorphism originate in northern Mongolia?". International Congress Series. 1261: 325. doi:10.1016/S0531-5131(03)01701-1. ↑ Derenko, Miroslava; Malyarchuk, Boris; Denisova, Galina; Wozniak, Marcin; Grzybowski, Tomasz; Dambueva, Irina; Zakharov, Ilia (2007). "Y-chromosome haplogroup N dispersals from south Siberia to Europe". Journal of Human Genetics. 52 (9): 763–70. doi:10.1007/s10038-007-0179-5. PMID 17703276. ↑ Rootsi, Siiri; Zhivotovsky, Lev A; Baldovič, Marian; Kayser, Manfred; Kutuev, Ildus A; Khusainova, Rita; Bermisheva, Marina A; Gubina, Marina; et al. (2006). "A counter-clockwise northern route of the Y-chromosome haplogroup N from Southeast Asia towards Europe". European Journal of Human Genetics. 15 (2): 204–11. doi:10.1038/sj.ejhg.5201748. PMID 17149388. ↑ Lappalainen, T.; Laitinen, V.; Salmela, E.; Andersen, P.; Huoponen, K.; Savontaus, M.-L.; Lahermo, P. (2008). "Migration Waves to the Baltic Sea Region". Annals of Human Genetics. 72 (Pt 3): 337–48. doi:10.1111/j.1469-1809.2007.00429.x. PMID 18294359. ↑ F.-X. Ricaut, O. Safedoseva, C. Keyser-Tracqui, E. Crubézy, B. Ludes, in press. Genetic analysis of human remains found in two medieval Yakut graves (At-Dabaan site, 18th century), Int. J. Legal. Med. ↑ Amory S, Crubézy E, Keyser C, Alekseev AN, Ludes B (October 2006). "Early influence of the steppe tribes in the peopling of Siberia". Human Biology. 78 (5): 531–49. doi:10.1353/hub.2007.0001. PMID 17506285. ↑ Keyser-Tracqui C, Crubézy E, Pamzsav H, Varga T, Ludes B (October 2006). "Population origins in Mongolia: genetic structure analysis of ancient and modern DNA". American Journal of Physical Anthropology. 131 (2): 272–81. doi:10.1002/ajpa.20429. PMID 16596591. ↑ Yu CC, Xie L, Zhang XL, Zhou H, Zhu H (October 2007). "[Genetic analyses on the affinities between Tuoba Xianbei and Xiongnu populations]". Yi Chuan (in Chinese). 29 (10): 1223–9. doi:10.1360/yc-007-1223. PMID 17905712. ↑ A western Eurasian male is found in 2000-year-old elite Xiongnu cemetery in Northeast Mongolia. Am J Phys Anthropol. 2010 January. ↑ 趙甲済 (2004-03-01). 騎馬흉노국가 新羅 연구　趙甲濟(月刊朝鮮 편집장)의 심층취재　내 몸속을 흐르는 흉노의 피. 月刊朝鮮. ↑ 김운회 (2005-08-30). 김운회의 '대쥬신을 찾아서' <23> 금관의 나라, 신라”. 프레시안. ↑ 경주 사천왕사(寺) 사천왕상(四天王像) 왜 4개가 아니라 3개일까. 조선일보. 2009-02-27. ↑ 2부작 <문무왕릉비의 비밀> - 제1편: 신라 김씨왕족은 흉노(匈奴)의 후손인가?. KBS 역사추적. 2008-11-22. ↑ 2부작 <문무왕비문의 비밀> - 제2편: 왜 흉노(匈奴)의 후예라고 밝혔나?. KBS 역사추적. 2008-11-29. ↑ (채널돋보기) 신라 김씨 왕족은 흉노의 후손일까. 매일신문. 2008-11-21. (Russian) Davydova, Anthonina & Minyaev Sergey. The complex of archaeological sites near Dureny village. In: Archaeological sites of the Xiongnu, vol. 5. St Petersburg, 2003. (Russian) Gumilev L. N. 1961. История народа Хунну (History of the Hunnu people). (Hungarian) Helimski, Eugen. "A szamojéd népek vázlatos története" (Short History of the Samoyedic peoples). In: The History of the Finno-Ugric and Samoyedic Peoples. 2000, Eötvös Loránd University, Budapest, Hungary. (Russian) Kiuner (Kjuner, Küner) [Кюнер], N.V. 1961. Китайские известия о народах Южной Сибири, Центральной Азии и Дальнего Востока (Chinese reports about peoples of Southern Siberia, Central Asia, and Far East). Мoscow. (Russian) Klyashtorny S.G. [Кляшторный С.Г.]. 1964. Древнетюркские рунические памятники как источник по истории Средней Азии. 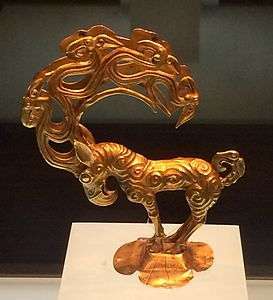 (Ancient Türkic runiform monuments as a source for the history of Central Asia). Moscow: Nauka. (German) Liu Mau-tsai. 1958. Die chinesischen Nachrichten zur Geschichte der Ost-Türken (T'u-küe). Wiesbaden: Otto Harrassowitz. (Russian) Minyaev, Sergey. Derestuj cemetery. In: Archaeological sites of the Xiongnu, vol. 3. St-Petersburg, 1998. (Russian) Minyaev, Sergey. The Xiongnu cultural complex: location and chronology. 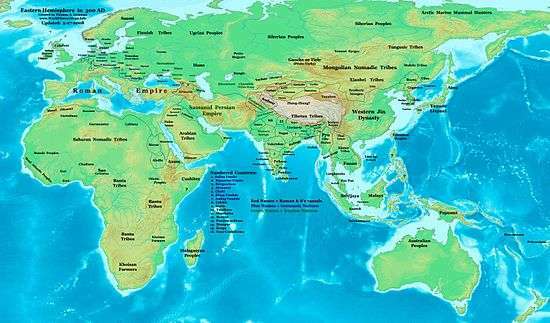 In: Ancient and Middle Age History of Eastern Asia. Vladivostok, 2001, pp. 295–305. (Hungarian) Obrusánszky, Borbála. 2006 October 10. 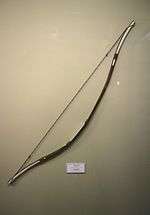 Huns in China (Hunok Kínában) 3. (Hungarian) Obrusánszky, Borbála. 2009. Tongwancheng, city of the southern Huns. Transoxiana, August 2009, 14. ISSN 1666-7050. (Russian) Potapov L.P. [Потапов, Л. П.] 1969. Этнический состав и происхождение алтайцев (Etnicheskii sostav i proiskhozhdenie altaitsev, Ethnic composition and origins of the Altaians). Leningrad: Nauka. Facsimile in Microsoft Word format. (German) Pritsak O. 1959. XUN Der Volksname der Hsiung-nu. Central Asiatic Journal, 5: 27-34. Psarras, Sophia-Karin. "HAN AND XIONGNU: A REEXAMINATION OF CULTURAL AND POLITICAL RELATIONS (I)." Monumenta Serica. 51. (2003): 55-236. Web. 12 Dec. 2012. <http://www.jstor.org/stable/40727370>. (Russian) Talko-Gryntsevich, Julian. Paleo-Ethnology of Trans-Baikal area. In: Archaeological sites of the Xiongnu, vol. 4. St Petersburg, 1999. (French) Vaissière, Étienne de la. 2005. Huns et Xiongnu. Central Asiatic Journal, 49(1): 3-26. Vovin, Alexander. 2000. 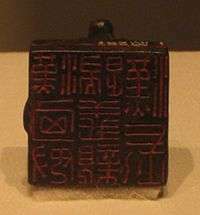 Did the Xiongnu speak a Yeniseian language? Central Asiatic Journal, 44(1): 87–104. (Russian) Zuev, Yu. A. [Ю. Л. Зуев] 1960. К Этнической Истории Усуней (Ethnic history of the Wusuns). Trudy Instituta Istorii, Arkheologii i Etnografii, VIII. Alma-Ata: Akad. Nauk Kazakhskoi SSR. (Russian) Потапов, Л. П. 1966. Этнионим Теле и Алтайцы. Тюркологический сборник, 1966: 233-240. Мoscow: Nauka. (Potapov L.P., The ethnonym "Tele" and the Altaians. Turcologica 1966: 233-240).